Just a year ago, Ethiopia and Kenya were mired in political crises on the brink of potential civil war from inter-tribal conflict. Since then, major changes have taken place in Ethiopia under Prime Minister Abiy Ahmed, who has enacted numerous reforms and brokered a peace deal with neighboring Eritrea. After a highly disputed election, Uhuru Kenyatta is once again the president of Kenya. As two of the largest economies on the continent, the two East African powerhouses are at the center of China’s largest transport infrastructure investments on the continent. Under the Belt and Road Initiative (BRI), Beijing has financed more than 3,000 strategic infrastructure projects in Africa and provided tens of billions of dollars more in the form of loans. A decade ago, China surpassed the United States to become Africa’s largest trading partner. Ethiopia and Kenya account for a substantial portion of Chinese lending in Africa, along with Djibouti; their debt obligations to China are high and growing. China is now Kenya’s largest bilateral debt lender and Kenya’s debt to China has increased tenfold in just five years. China has invested approximately $14 billion in Djibouti, much to do with its geostrategic location and hosting of China’s first overseas military base. China’s most significant railway projects in East Africa are the diesel-powered Mombasa-Nairobi Standard Gauge Railway built in Kenya, and the Addis Ababa-Djibouti Railway, which is the first electrified railway of its kind in Africa. Both railway projects, costing $3.4 billion for Ethiopia and $3.2 billion for Kenya, are standard gauge railway projects paid for by Chinese loans. The two-year-old light-rail system in Addis Ababa, the Ethiopian capital, was financed by China as well to the tune of $475 million. Ethiopia asked this year for its debt connected with the railway to be restructured over a longer period of time (30 years) after acquiring significant debt to built its light rail system in the capital and a train line from Addis Ababa to Djibouti. The new lines run much faster and carry millions of tons of cargo per year, which is intended to improve regional trade and reduce road congestion. The new train line cuts the travel time to Djibouti to just 12 hours; the same trip by road could take days. The system is operated by Chinese conductors but Beijing has promised operations would be turned over to local workers after five years. The two projects have been mired in controversy over their costs. In August 2018, Kenyan authorities arrested two top officials for suspected corruption over the new $3 billion Mombasa-Nairobi railway. Last week, according to a VOA report, the Kenyan government faced a major backlash after the details of its contract with China Exim Bank was released. There are fears that Kenya could potentially lose the Port of Mombasa to the Chinese government if the government-owned Kenya Railways Corporation (KRC) defaults on a substantial payment owed to Exim Bank. Also still in question is the real cost and whether Kenya overpaid for the railway project. Some countries have pulled out of infrastructure projects with China for this exact concern. The Kenyan railway project has also been criticized for running through Tsavo National Park and Nairobi National Park. On the Addis-Djibouti line, Ethiopian farmers often block the tracks and demand large sums if their animals are killed by the train. The increasing debt from these projects has many concerned over Ethiopia’s and Kenya’s rapidly growing trade imbalance with China and what this means for the future of the region. Nicholas Muller is an American photojournalist and writer. He has a double MA degree in Chinese foreign policy and European Affairs from Sciences Po-Paris and Fudan University-Shanghai. 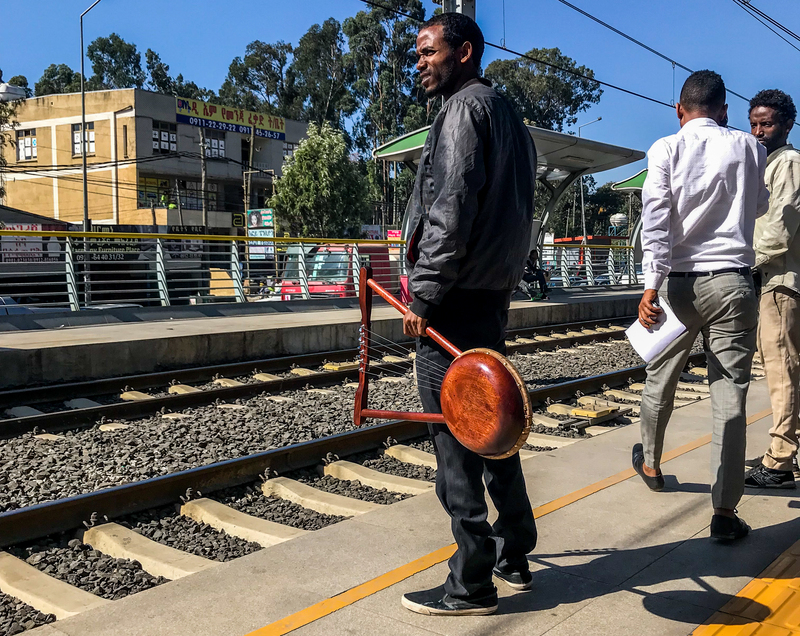 A man stands on the platform of one of the light rail stations in Addis Ababa. The two-year-old light-rail system was built in the Ethiopian capital for a cost of $475 million, largely funded by Chinese loans.